This app is absolutely awesome, and there is a good chance you already have it right there on your Mac. Without even knowing it. We have sneaked a totally wicked but secret feature into Pixelmator 2.2 Blueberry. It’s a trick to convert your standard Pixelmator into a completely new drawing app. We call this new app (or more accurately this mode of an app) Vectormator. Vectormator brings up and conveniently places all of the drawing tools and palettes on your screen. So you can create stunning shapes, illustrations, logos, and so much more, more easily than ever before. To switch to Vectormator, simply press the Command-Shift-V keyboard shortcut, and watch the tools and palettes instantly change to Vectormator. To switch back to your Pixelmator, press the same keyboard shortcut again. Watch that happen in our short Vectormator video or try it yourself now. This is it. 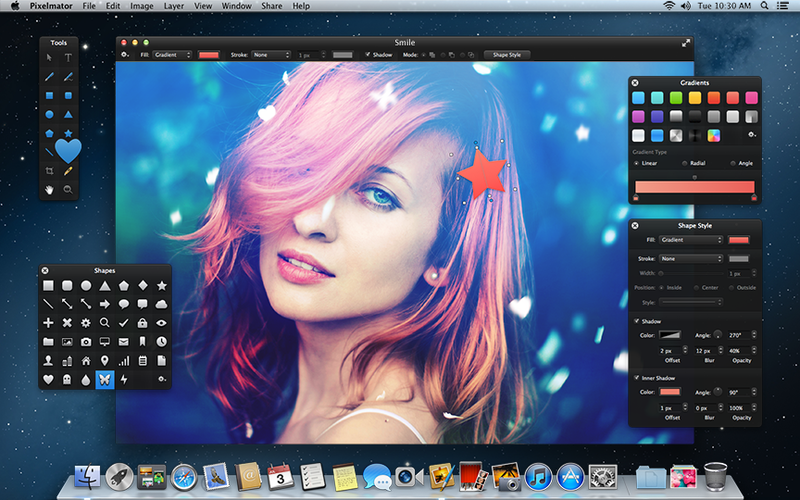 Pixelmator is now a fully featured vector graphics app. This is pretty awesome, although I wouldn’t say this makes Pixelamtor a fully-featured vector graphics app. Most notably: the way you handle boolean operations lacks the precision required in a vector graphics app. In all other vector drawing apps, you first create and align the shapes you want to intersect, subtract, or union, and then apply the operation. This lets you to align shapes very precisely before performing the operation. In Vectormator, you need to go set it to subtract shape mode and then draw the desired shape you want to subtract, which makes everything significantly less precise! I see that you can still move the shape you are subtracting from (or whatever) but it doesn’t seem like you can modify the bits you are subtracting off? It’s a nice start, but has nowhere near the power of an app like Sketch. It would have been better if you focused your efforts on features to finally start being competitive with Photoshop, like layer styles. This post needs more positive comments. Completely unexpected feature and awesome to boot. More like this! Any chance you add more web design features in the future? Like .svg support and @2x export? Wow this is awesome! I can’t wait to get home and try it. Thanks for the wicked surprise! That’s really great. Finally the vector editing tool is announced, we all were waiting for. Thanks a lot. Of course it’s the “first” release of Vectormator and there are many features missing to compete with other vector editing tools but Pixelmator used to be tiny too and now it rocks. I really hope you guys focus as much on Vectormator as you do on Pixelmator. Ok, I am seriously blown away with your updates. Love you guys! Make 3.0 a paid update please! Thats what I call smart thinking. Thank you! I don’t know a whole lot about vectors, so I don’t know if this mode is basically a clutter-free environment, or actually enhances vector capabilities. Either way, great to see that devs like you still exist. Cool, but is there any other way to activate this? ? ?V conflicts with a global keyboard shortcut I already use. Amazing. But It is useless until you add support to import other vector formats like svg.Thx! loved how you sneaked it in;) thx! Very nice way of switching views quickly. I’d really love if it was possible to bring in a Sketch (Bohemian Coding) file as a ‘smart object’ as Photoshop does with Illustrator files. I used to have an old Pre-Appstore version of Pixelmator. This just provided the reason for me to upgrade. A comment on some other comments: The folks at this small company just gave us a gift. There is something ungracious to complain that the gift doesn’t include this or that feature. My god, it’s a gift. And, you know that it’s only going to get better. It’s the equivalent of a beta version but more useful and usable than most beta software. So, please stop whining and show some gratitude for getting something you weren’t expecting and are not entitled to. Again, to the folks at Pixelmator, thanks much. There was a time when I was in a long term relationship with you Adobe. You were everything I ever wanted; and more! With a steady hand, my tutors showed me every facet of you over a five year period. You constantly revealed more about yourself, never disappointing with your seemingly endless talents. We made some beautiful things together, you and I. But as I grew, and moved on as a person the rot started to set in. Why did you have so many personalities? Why did I have to pick the right character from your many, many personalities to have a simple conversation with you. Achieving the great things that we once did so seamlessly became harder and more protracted? This schizophrenia became worse and worse. I would forget who I was speaking to, say the wrong thing and lose everything! What’s more you became messy! I like my house to be clean and tidy, with everything in it’s place. Who were these weird friends you were bringing home and letting sleep on the sofa? They seemed to not have a job, and only served to clutter up the place, eating all my food and drinking all my beer! And finally Adobe, the reason that I love you no more is really quite simple; you got fat! All the extra weight was cute at first, and I put up with it because of the extra fun it brought. But now, it’s just too much. I just can’t handle you anymore. I have to admit that I’ve moved on. I’ve found someone else. They are just as fun-loving as you once were, but without the baggage. We get on great, and whats’s more everything is so simple. I’ll admit that they can’t do some of the wondrous things you could, but we are happy together. And like it was at the start for us, they keep surprising me. I keep finding out new and exciting things about them, and I fall more and more under their spell. They are tidy, they are clean, they do everything that I want and nothing more; and what’s more Adobe, they’ve got an amazingly slim figure! This is why I’m leaving you for another. I’ve finally realised that I can do without you stealing my credit card and going nuts. I can do without your messy friends and I can do without your excess weight! My fling with another has turned into something more, and they have grown into that role the more I trust them. What’s more Adobe, I don’t regret a thing, and I won’t look back. Pixelmator…just don’t become Adobe over the years. I really hope the vector tools are developed further with every release. It just makes sense to have both capabilities in one app. The two types editing combined in the same app is truly a match made in heaven. Can’t wait to see what the Pixelmator/Vectormator team has in store for us in the next release. Great job guys! I love the direction you guys are headed. Inspired and innovative is Pixelmator at it’s best. This is something, really very good! I believe that many users Pixelmator / Vectormator, we are users of other vector app, please provide option to import/export SVG files. Go guys! Pixelmator team is the best! Pixelmator is becoming one of my favorite apps. Beautiful to look at, easy to use, makes me look better than I am. Made it easy to drop gimp and inkscape. $15?! Totally worth it. Risk free, really. Love the Automator support. Would it be possible to add Automator support for showing/ hiding layers before exporting? Why the edges of vector shapes are pixelated? Even on vector mode? There should be icon to make shape editable, not from a context menu (right click menu). Why I can not edit mask like in PS? I would like to paste mask from something I have painted. In PM I can not do this. I cant even operate on mask like in PS. Acorn can do it. Can PX team add a function to: When double click on mask (or alt + click on mask), would display mask in main drawing window, so I could edit mask manually, seeing what i am doing? I would like also filters to work on masks, and copy-paste feature when working /editing mask. PLEASE. When using Wacom tablet in PM I get angular circular lines, when in PS i get them as I want. Also in PM there is a HUGE lag when drawing fast with Wacom tablet. There is no such thing in PS. Nice! But how do you guys draw without being able to lock a layer? Do you just show hide all the time? great app(s). would like to be able to change the background for the tools to some lighter color – i find the black tiring. YES! use this guy for voice over for future tuts. Such an improvement. Great job on both the improvements to voice and program. “I find the voice of the tutorial lady extremely distracting. How can it be a vector graphics application if it doesn’t support eps, svg or seemingly any other vector format. A great start but eps is vital for us. I know you guys are on it, but this is just another request for both the ability to export to SVG and the ability to export SVG code (preferably much cleaner than Illustrator’s, please!). I have no issue paying an additional fee for this inclusion because of how much I would rely on it. Thank you guys so much for all the work you do. PLEASE PLEASE PLEASE continue to expand on the ‘vector, snap, alignment, non-destructive shape settings, import/export, edit, point, edge, line editing, etc,’ -tools. I am torn by you guys. Pixelmator is a great app but you do some ridiculous things. Why the hell would you HIDE this feature. It should be right up there clear and simple in something like the view menu. Also the shortcut you have chosen conflicts with snipping on Evernote. And Evernote is a fairly popular app. Please stop doing silly things like this and make a great app awesome. This feature is great and can only get better. It may not have every feature other vector apps have but its a great start. I had this idea of unifying Vectors and Pixels into a single App for quite some time, as they share quite an amount of common controls – now you did it! Welldone for a Start. Can’t wait to see read/write support for common vector formats like PDF/EPS/AI…! I love this. I don’t need to use two applications and can easily mix vector with raster. Otherwise it’s useless to me. Another thumbs up for ***SVG support***! That would be an instant purchase from me! Love the UI btw, amazing app. Thumbs up for this! Also try the new Vector SNAP app… it easy to use via iphone and you can save the actual vector image to use later on. Printing made easy!!! Does it matter? Ok, I'm David. 1. It is impossible to import a vector shape. You can “import” PDF, but the output image will be rasterized, which makes it pretty much worthless. 2. It is impossible to export a vector shape. Same only option – a rasterized PDF. Can anyone please tell me, what am I supposed to do with it? 3. No support for EPS, AI, even SVG. Oh, come on. See, it’s just a toy, which doesn’t have even essential features of a vector graphics app, especially a “fully featured” one. So please stop fooling people and start calling things their names. And let me re-assign/bind hotkeys already. Vectors can be transferred via PDF format. Many cocoa apps use this already. It’s supported by many (all?) 3D apps as well. Great work guys. I, actually, think you guys should talk to Andrew Stone. If he doesn’t update Create, perhaps you could do something with it…. hmmm… hint, hint… nod, nod… wink, wink. I’ve suggested the converse…. or… Is this the result of a secret collab? Gasp! Hmmmm Actually, handshakes with other companies might be nice. It was/is one of the STRENGTHS of the Apple/Mac world. If Apple (and others) likes PDF as a universal format, it’ll make everything easier for… everybody. I’ve loved Pixelmator from the start. I wanted an image editor on par with Create’s vector/document/web/animation-ish functionality. Seashore was great, Chocoflop was promising. Chocoflop’s creator deferred to you guys, noting that you guys were what he was attempting. Kudos. I’m definitely with you! Again…. Wonderful app… I’m LOVING the tutorials too! I really wish there was a separate vector app or vectormator mode perfected to be able to import .eps files. Other than that, great app, keep it going guys. Supper cool. BUT, without some way to lock down the background, all but useless to me. I draw a couple of squares, want to select them to group them together, and inevitably end up moving the background. Much cursing ensues and I switch to Sketch to actually get some work done. Seriously, how does anyone work when the background is so easily grabbed by accident? Fix this and I’ll probably never close Pixelmator, but without locking backgrounds I’ll just use Pixelmator for, you know, pixel stuff. Thanks guys, so useful. Keep the updates coming, use pixelmator exclusively these days. I love Pixelmator in every way and I think it will be so much more useful when it adds SVG support. Vectormator seems unpractical unless SVG support is there. I guess that’s probably why Vectormator is a semi-secret feature, just another way of saying “Beta”. Works well on Mavericks 10.9. Needs individual vector manipulation. Needs to turn type not just to vector but individual vectors, line cut and join plus vector line duplication in a circle – say for seconds around a clock face. These are absolutely fundamental, totally essential. Apart from that I’m a big fan of Pixelmator and I was a user of Photoshop and Freehand. Pixelmator also works well with Cheetah3D, a quite brilliant program and way ahead in ease of use. Cheetah also works seamlessly with Unity game engine (not cheap but free if you publish with their Made with Unity logo). Pixelmator is all you need for your 3D bitmaps so it’s the front end for both these programs. Also Pixelmator works for working up stills for iMovie and Motion5. Just get the vector manipulation in there Pixelmator so I don’t have to switch partitions to run Freehand on OS 10.6.8. Go to hell Adobe – you took my money then dropped Freehand and Golive. Now you think you can rent your Creative Suite by the month, you deserve what’s coming. I am one of some web developers who use (almost solely) fireworks for a living. I can still feel my pain when I read how adobe coldly killed fireworks! I want to leave adobe for good –> hence my search for alternatives. I’ve been dragging myself to learn how to use new programs. I refuse to use Ps + Ai or Edge whatevers. I am now using Bohemian Coding’s Sketch on daily basis, I find it okay as vector programs, I really like how it helps my prototyping and wireframing process by providing the “make-grid” feature, but the app barely handles bitmaps which leads me to Pixelmator. I dont know how you see us as a market, but there really is a void left by fireworks, and you need to fill it or somebody else will. I really hope I can use one app to rule them all (just like fireworks was), so please add those three features and you’ll have my $30 (and I promise, every upgrade you charge, until you become adobe-like or purchased by adobe or somebody else came up with better workflow – Sketch, probably, I don’t know). So awesome!! Thank you. 🙂 Your app is such a great value. I live Pixelmator. Its very very good. I only wish it had more optional for vector drawing. Better SVG Support for Import Export. I love you Pixelmator people, don’t ever change, you’ve nailed it and I tell all my friends that Pixelmator (now with vector editing!) is THE must have app. -Thanks! I love Pixelmator – I use it every day. Like everybody else here, I would love it even more if it could import/export SVG. I just purchased Pixelmator after reading a review on Lifehacker. I designed a logo over the past few hours. Working with vector graphics in Pixelmator was much easier than Photoshop, which was pleasantly surprising. I really do need an export to SVG feature though… I don’t want to send my logo to the t-shirt company in a rasterized format. Excellent software though! I plan to use it as my primary graphics editor. Pixelmator for iPad, with iCloud sync feature. Alongside with iDraw / iDraw for iPad and Pixelmator / Pixelmator for iPad, the iPad would become the best companion for graphic artist on the go. Even a less sophisticated version, with syncing, and even limited editing possibilities… But, really, would be so useful to meet the customers. I can’t stand the Adobe pricing policy anymore, I love Illustrator and Photoshop, but to be honest, iDraw (sorry for advertising here) and Pixelmator are as good for a way much better price value. Please consider creating an even limited iPad version … A lot of people would buy it at 9.99 or 19.99€ for sure (probably all the customers who own an iPad). You definitely must thing about it. There really need to be a GUI switch for this. Preferably a check box in one of the menus as well as a piece of text somewhere that tells you, that you are in vectormator. A lot of your shapes have small problems. For example: The edges of a triangle doesn’t reach the edges of the box used to resize it, and the bottom line of the traingle is raised above the same box. This not only makes it difficult to align the length of a triangle with the side of a square, it also makes it jump in unpredictable ways when resizing it. There aren’t really any vector formats that you can export to. This is very annoying as well. THe shortcut to switch conflicts with Sophos virus protection, how the hell do I get back to Pixelmator mode??! @johnnykrisma, press Command-Shift-V. If you were able to go into the Vectormator mode, you should be able to go back using the very same keyboard shortcut. This is great, but I noticed that I cannot save in a vector file format. So is this considered a beta test? I would love it if there was a way to save in a vector format in the very near future. Thanks so much for your efforts. In the meantime, does anyone have any programs they use to save in vector formats? @Sweety, Pixelmator is fully working app. Vectormator is a Pixelmator mode where drawing features are conveniently placed on your screen. Vector file formats aren’t supported and we don’t have plans to support them in the near future. I would recommend to have a look at Sketch app for vector drawings. It’s developed by Bohemian Coding. Guys, this is really cool, but it does nothing for anyone who wants to trace bitmaps into vector format and export them as scalable SVGs. I just did what I needed and… I couldn’t export to SVG!!! This is not a vectorial design app, it’s a vectorial drawing tool that cannot export (or import) vertorial… ridiculous! Please add support for SVG export. March 2015 and pixelmator still can not export vector formats. This is it. Pixelmator isn’t a fully featured vector graphics app. Thanks for all the hard work and pushing out great features: very very appreciated. We really need ai/eps etc import and (at least svg) export! +1 for the ai/eps import and export necessity. SVG export please! Or at the very least release a .pxs to .svg converter command line tool ASAP. Or publish the file format for .pxs and get someone else to do it. Anything really to do the job that needs doing. Please create a vector export option!!!!! Please publish this for all to read. Many thanks for Pixelmator use of very stable vector shapes. I would like to confirm, “Vectormator is a warm-and-fuzzy tease!” Now, why should we enjoy that tease? To illustrate the universality of our workspace bitmap screen dependence in standard icon art work, Pixelmator like Photoshop always makes Vector shapes available. Almost like photoshop, Pixelmator Vector shapes have limitations. More on that ‘almost’ below. For now, we will demo screen dependence to explore those limitations. Set your Pixelmator in whatever ‘mode’ you like. Duplicate a ‘parent’ even-integer (x-z coordinates), square and upright rectangular Vector shape 45% left or right, and Pixelmator users do see the ‘child’ transformed Vector shape drop 0.7666 pixels, occupying the balanced shape whole-number margin, but effecting a one-pixel fade-out along the sloped margins. Transformed shape snaps into the bitmap Pixelmator workspace with its very useful pixel-by-pixel bitmap Grid (Option-Command-Apostrophe). Now, referring to that Grid, duplicate that ‘parent’ again and transform 315 degrees. Next, align ‘child’ bottom left to the ‘parent’ bottom left. REMEMBER to shift the child transformed vector shape 1 pixel right of its true vector alignment points (alignment points are the tiny white squares visible when using the cursor’s Move Tool). This will accommodate the fuzzy 0.7666 overlay, nicely. Perform various shape alignments, and we all see that, whatever mode we use, vector shapes minimize margin degradation, while Pixel shape degradation is more pronounced (and chaotic). Unfortunately, there is no way for Pixelmator to convert a Pixel shape to a Vector shape. But there is a Shapes pane command to ‘import’ Vector shapes, that might work some day. Even if Pixelmator is not for now going to use a vector workspace. HELLO VECTOR SHAPES in any mode! Pixelmator vector shapes are very stable. Stress that Pixel shape margins degrade during work: Vector shape margins do not degrade, excepting the inevitable, 100% predictable and reliable, warm-and-fuzzy transform thing described above. Adjust workflows accordingly: keep shapes in vector format and Convert to Pixels only at the end. This way, almost like in Photoshop, we minimize shape margin degradation. I say ‘almost’ because factually, Pixelmator is better than Photoshop. Photoshop shape degradation is typically twice as fuzzy as Pixelmator’s degradation, because unlike Pixelmator, Photoshop degrades its Vector margins at the same time as Pixel shape layers’ margins degrade, even if the Vector shape is locked in place! Hmm… Pixelmator has less bells and whistles, but is more [twice as] reliable. One last thing for the curious. If you try and copy a Vector shape from Pixelmator to Photoshop (or visa versa), nothing happens. Use Pixelmator Vector shapes **intelligently**, retaining a work flow that maximizes vector deployment. Convert to Pixel shapes only when absolutely necessary. Use the best shape margins, Vector shape margins. FYI! Surprise Command-Shift-V pane reset sometimes makes big dif on quad cores. Mac 6-core Pixelmator is simply put, completely excellent. Has anyone checked out 12-core? How do you export in a vectored format? Where is the export to SVG function ? Hi 🙂 Does Vectormator come with the new Pixelmator Pro? I’m trying it out for free for 30 days and want to see all that it can do. Is Vectormator one of the possibilities? We need to be able to open and save files in vector format. Is that coming? Is it even in Pro? But, How do you open an svg in pixelmator as vectormator! ?